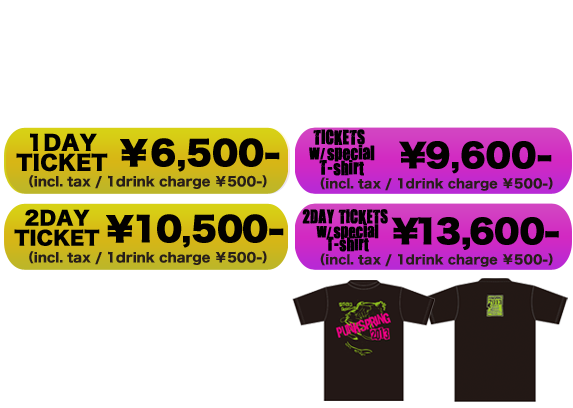 Tickets with Punkspring 2013 official T-shirt now available on e+! PUNKSPRING is a music festival being held in TOKYO (Chiba), OSAKA and NAOGYA, however the line-ups for the 3 cities are not identical. Each event issues each and respective tickets to enter, and therefore Tokyo venue/ Osaka venue/ Nagoya venue do NOT share tickets. The event will take place for long hours. It is your responsibility to make certain of one’s physical well-being. Please bring clothing suited for all weather including comfortable footwear (Platform shoes or heels may cause falls), and pay attention to any symptoms of illness, heat and sun exposure.